We are excited to be working with United Way of Door County! In an effort to help more people learn about the amazing work the United Way of Door County we have digitized their tri-fold brochure and have added it to our NewsPixelsTM platform for distribution and even more discovery. Now, when a potential donor or volunteer wants more information on how their donations impact the community, they can quickly flip through this guide to get the stats and details. 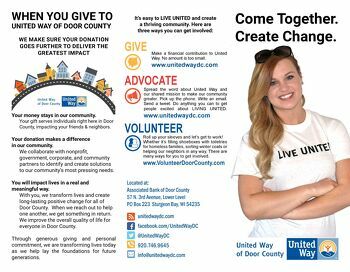 They can also click through to United Way of Door County’s website to sign up to volunteer, donate or learn more about their upcoming events. It is easily shareable, linkable and interactive. We will also promote their brochure through our Door County Social network to help it get in front of even more people. This also helps save on shipping/mailing costs is this brochure can be viewed on any device, desktop, smartphone, tablet, and even cast to your smart TV. A modern, effective way to get your message to the right audience.